Former Malaysian Prime Minister Najib Razak on Wednesday was charged with three offenses related to money-laundering and anti-terrorism financing, in addition to several counts of criminal breach of trust and corruption charges that were served in early July. The 65-year-old former leader appeared at the Kuala Lumpur Courts complex at around 9 a.m. local time for a pre-trial case-management hearing. After the prosecution team read the new charges in court, he pleaded not guilty and claimed trial. Malaysia's anti-corruption commission said earlier all the charges are related to a 42-million-ringgit (10.3 million U.S. dollars) deposit into Najib's personal bank account by SRC International, a former unit of state fund 1MDB. 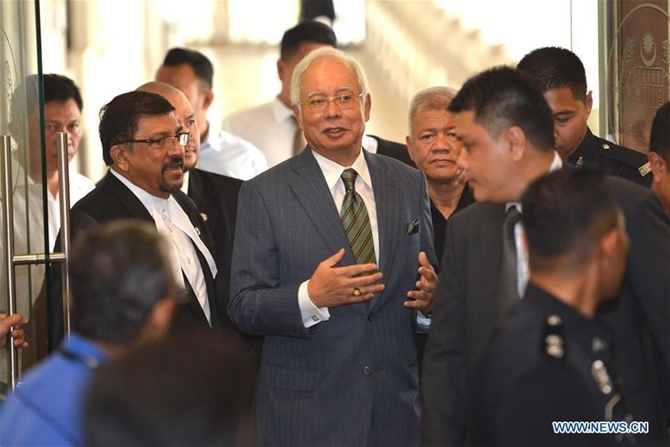 At the court, the prosecution stated that the 42 million ringgit, transferred in three tranches into Najib's bank account, were obtained from illegal activities. Each of the three money-laundering charges carries a maximum sentence of 15 years in prison and a fine of up to five times of the ill-gotten wealth. The multiple charges filed against him in July were also connected to SRC International. The judge postponed his decision on the trial date to Friday and said he will also settle the gag order, which was issued earlier to prevent the public from commenting on the merits of the case in a biased manner. 1MDB was set up by Najib in 2009 to spur Malaysia's economic development. But report emerged later that billions of U.S. dollars were misappropriated. Najib has been under investigation related to 1MDB since losing the general elections in May but has denied any wrongdoing. After the election, Malaysian Prime Minister Mahathir Mohamad has stepped up his efforts to probe the case. On Tuesday, a 250-million-U.S. dollar super yacht arrived at Malaysia after the Indonesian authorities impounded it on the basis that it was purchased with stolen money from 1MDB.